'Belo' ( Mary Dunn, R. 1990). Seedling #M75-557-3. BB, height 22" (51 cm), Midseason bloom. Standards pastel orchid, slightly deeper edge; falls pastel orchid, slightly deeper ruffled edge; matching beard. 'Grand Waltz' X 'Whirling Ruffles'. M.A.D. Iris Garden 1991. 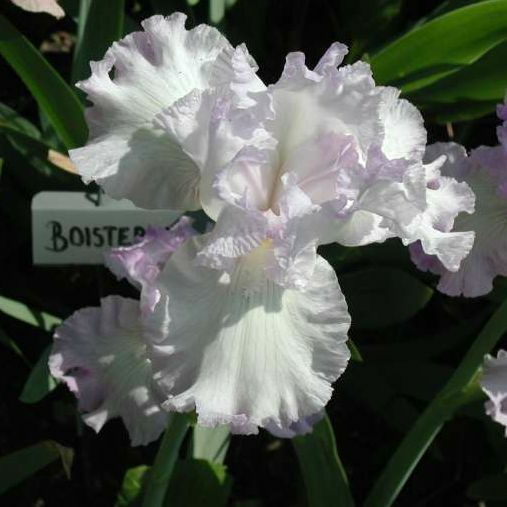 From AIS Bulletin #281 April 1991 Introducing BELO-Our first border iris, this little beauty has been blooming in the BB class for some time. Here it is. I hope you enjoy it. Very ruffled icy orchid self, bit deeper in color at edge of petals. Matching beards. Usually many stems with lots of flowers. Good substance and form, 20". Grand Waltz X Whirling Ruffles. $20.00. M.A.D. Iris Garden.